Yes, that's Forty Hall on Forty Hill, which is a bit confusing. This manor house is coming up on 400 years old, and still looks much as it did when Sir Nicholas Raynton moved in. He was a Lincolnshire haberdasher made good, who rose to the top of his City Guild to become Lord Mayor of London. That was in 1632, the year he moved to Enfield - ideal because it was the furthest a man could ride from London without changing horses. Henry VIII had thought the same, and he'd built Elsyng Palace a little closer to the river. Perfect as a base for hunting, he thought, and as somewhere for his children to stay. Indeed Prince Edward was here when he was told his father was dead and that he was now King. Queen Elizabeth popped by a few times, but by the 17th century the place was falling into disrepair, so the Rayntons bought the site to extend their estate. There's no sign of Elsyng today, just an avenue of limes running down through meadows to the historic site. But Forty Hall's still standing, and Enfield council would love you to visit. 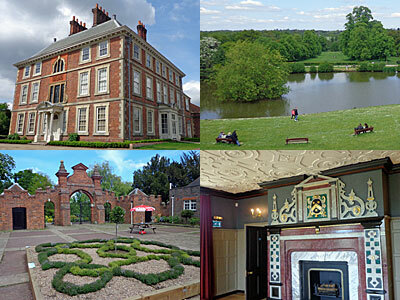 Following major renovation work, Forty Hall reopened to the public last June refreshed and renewed. I remember a fairly drab interior when I last visited in 2004, but things are very different today. A volunteer welcomes you in the entrance hall than sends you on your way round the building. Alternatively you can turn up for one of three themed tours, each run monthly... although I turned up at the appropriate time on Saturday and there was absolutely no special tour at all. The restoration is impressive, however, especially on a council budget. Rooms have been given a decent slap of paint, stylish information panels have been added, and even the occasional audio presentation rings out as you walk around. The house's history gets a good airing, and much is made of Sir Nicholas's Mayoral term to try to make him sound important. If you're an adult there's plenty to take in, and if you're a child there's a foam elephant's head to put on. Honest. Exit is via the gift shop, a surprising intervention, but thoughtfully stocked. This barn-like gallery doubles up as an exhibition space... currently for a series of floral-inspired contemporary works from the Crafts Council, most interesting. And exit is then via the cafe - officially the Courtyard Cafe - which if anything was a little busier than the house. Apologies, but I walked on to get a lemon ice cornet from the van in the car park, which was damned good value for money, but no guarantees it'll be here for your visit. Lots of Enfielders had driven in to enjoy the house and grounds, many with dogs to exercise, others as somewhere to take the kids. The cedar tree on the front lawn is one of the oldest in England, vast, and almost as old as the house. And the ornamental gardens round the back are currently at their spring finest, with flower beds blazing with colour and a wisteria walkway in gently blooming blue. Step one on our walk up Forty Hill, and it's a winner. At Capel Manor College they teach 3500 students how to do gardening. They call it horticulture, because that always looks better on a certificate, but gardening is the essence of it. The college has vast grounds, which the students toil in, and their end results are thrown open to the public. Think of Capel Manor not as North London's Kew Gardens but as Enfield's Chelsea Flower Show, open all year round, with a variety of micro-gardens squished artfully together. Indeed many medal-winning gardens from Chelsea can now be found here, yours to see for £5.50 rather than whatever extortionate price the real thing demands of its visitors these days. 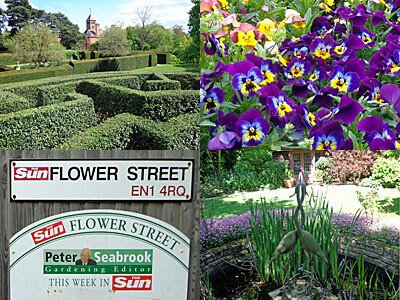 I was unnerved on entering Capel Manor Gardens to discover an area called Sunflower Street, notionally sponsored by The Sun newspaper, replete with sponsored gardens. The Scotts Miracle-Gro Garden, a Mr Fothergill's garden, even a low allergen garden sponsored by some company that sells low allergen stuff. Thankfully that doesn't continue around the entire site, but often you'll spot a sign saying "turf provided by Rolawn" or "this lawn has been cut using a Hayter lawnmower". And that's fine, because most visitors are here to gather inspiration on what to do in their gardens back home, so it's very useful to know where the constituent parts come from. Gardening Which have their testbeds down beside the M25, currently checking on best value tulips and bergenias for publication in next year's magazine. Elsewhere the end results of the students' handiwork are impressive, be that an Australian garden or a Victorian garden or a garden with raised beds ideal for the disabled. I enjoyed dashing round the hedge maze, built on the site of a 300 year old copper beech destroyed in the Great Storm, with a fine view from the central tower when I succeeded in reaching the middle. I did feel a bit on the young side walking around - not for nothing is the entire site wheelchair friendly. But not as young as David and Rachael who'd picked a glorious day to hold their wedding here... with the ceremony based in a ruined folly designed to look like a tumbledown abbey. Apparently it's made of stone, although I thought it looked like characterless fibreglass, so if you want to waste £6295 on a Gothic folly for your back garden then go ahead. If you have a garden, and are proud of its contents, you'll no doubt find much at Capel Manor to inspire. Alternatively watch out for the weekends when they host some other event here, like next weekend's Heavy Horse Show, or July's Scooterfest. I got to enjoy the Lea Valley Cactus & Succulent Show, which isn't quite in the same league, but which continues today if you're interested. And while you're here, maybe drive up Whitewebbs Lane to Crews Hill which has the greatest concentration of garden centres anywhere in London. That's North Enfield for you, the unexpectedly horticulturaltastic destination.